By Connie Cramp. Connie is a student going into her third year at King’s College London. For almost two years now I have been working in a well-known shop specialising in outdoor equipment. I took the job because I grew up in a family that had a passion for the outdoors, and I had been climbing, walking and travelling for most of my life – I thought my knowledge and experience of the outdoors would be useful in helping other people. But during my time at the shop, it’s slowly become clear that the world of outdoor activities is not always a welcoming place for a woman. What strikes me most about the shop is the difference between the ranges of clothing available for men and women – women are given a wide selection of casual t-shirts and skirts, but not much actual, technical clothing that would be useful in the outdoors. The range of technical clothing for women is less than half of what it is for men, and it’s mostly pink and purple. I’ve had customers complain to me many times that they’ve found what they want but they won’t buy it because it only comes in bright pink. The same applies to most of the products directed at women – boots, rucksacks and sleeping bags, are overwhelmingly pink and purple if they are aimed at women. Even the socks are gendered – a few weeks ago, I found myself stocking the shelves with a range of socks aimed at women called ‘Trail Diva’. Recently, the visual merchandising guy came in and redecorated the whole of the women’s section so that now it looks more like someone’s living room than a place which takes seriously a woman’s desire to explore the outdoors. He’s dressed the mannequins so that they’re wearing floaty skirts and strapless dresses, instead of the walking trousers and boots that the men’s mannequins are wearing. If the shop is supposed to be encouraging women to engage with the outdoors, it’s not doing a very good job. It looks more like it’s encouraging women to sit on the side-lines and look pretty, while the men do all the climbing and the mountaineering. This all came as quite a shock to me. Given the vast array of female role models in outdoor pursuits it seems strange that the shop can’t take women seriously as consumers of outdoor equipment. There are so many amazing, talented women in outdoor pursuits – Lucy Creamer, for example, eight time British Climbing Champion, or mountaineer Alison Hargreaves, who was the first woman to summit Everest solo and without oxygen, or Squash Falconer, who paraglided from the summit of Mont Blanc last year, or Leah Crane, who won the British Bouldering Championships in 2009 at the age of just 18, or Arunima Sinha, the first female amputee to scale Everest. In 1808, Marie Paradis was the first woman to successfully summit Mont Blanc, at just 18 years old. Gertrude Bell has a mountain in the Swiss Alps named after her, after she climbed it in 1901. Women such as Julia Bradbury, who presented, amongst other things, Wainwright Walks, German Wanderlust and Icelandic Walk, are putting women’s walking and mountaineering in the public eye, and showing that women can be just as passionate about, and skilled in, the outdoors as men can. This is just a tiny insight into some of the many women who are highly skilled, adventurous people with a passion for outdoor challenges. It’s a shame that a chain of shops with the aim of helping people to enjoy the outdoors safely and comfortably can’t be more inclusive. 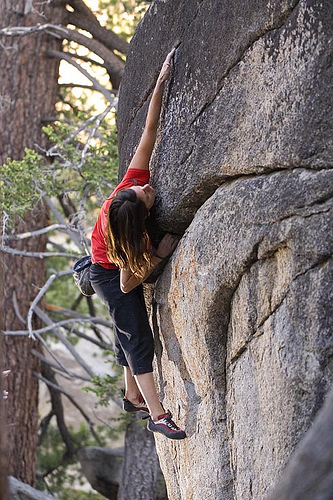 It’s always been difficult for female climbers to prove themselves. This article in the Guardian shows how women struggled with the prejudices of men, trying to free themselves from the expectations of 19th century society. More recently, in 1995, Alison Hargreaves was widely criticised for being an irresponsible mother, after her death while climbing the notoriously difficult K2 in the Himalayas. As far as I know, there are very few, if any, stories about male mountaineers being careless fathers for undertaking such a dangerous activity. Two weeks ago, a team of all-female climbers scaled the shard for Greenpeace, to protest against drilling in the Arctic. This was, bizarrely, criticised by Telegraph writer Toby Green as ‘sexist’, because an all-female team implied that it was ‘harder for a woman to climb a tall building than a man’. Despite consistently equalling and surpassing the performances of men in areas such as mountaineering and climbing, it seems that women are still seen as somehow less worthy of attention. And this, I think, is a point illustrated by the shop in which I work. Although it’s true that it isn’t really aimed at professionals, the shop is the first port of call for many people who are interested in and passionate about the outdoors, and I don’t think it’s sending out a very good message to its female patrons – women are ‘divas’ rather than serious walkers, women need flowery skirts and casual shirts rather than waterproof trousers or soft-shell jackets, women only want pink clothing. With out-of-date, misguided ideas like these being peddled by one of the biggest retailers of outdoor equipment in the UK, is it any wonder that people still aren’t taking women in the outdoors seriously? Photo of climber Christina Pilo stretching upwards as she climbs a rock face by Susánica Tam, shared under a Creative Commons licence. This has interested the economist within me. Most retailers will do what they think will result int eh highest number of sales – or at least to maximise their profits. Does this mean that concentrating on pink and purple products or female leisure-wear over outdoor-equipment is beneficial to them? Or have they misread their customer base? Obviously this doesn’t touch on the principle that by their actions they’re discouraging women from participating. I would be interested to know if they’re following the market, leading the market or just getting it totally wrong. This annoys me intensely too as a keen mountain walker. I’ve just bought a new pair of boots in the Lake District and know exactly what you mean. The opposition from the salesman when I wanted mens’ boots because womens’ are just too narrow for my feet was amazing. I got mens’ boots, and they were grey not pink. I often end up with mens’ clothing too because it’s better technically and it comes in colours that don’t clash with my red hair! And as for dressing the female mannequins in floaty skirts, have you ever seen a woman up a mountain in a floaty skirt? A couple of years ago whilst doing the Coast to Coast walk, I was chatting to a fellow walker who told us she always bought mens walking trousers because they actually had pockets she could fit things in. The female styled ones were, in her mind, simply not practical. I have noticed some of the major retailers have been getting a hint of impracticality with their male ranges too. Part of the problem is that we’ve got this whole “outdoor chic” thing, with some brands becoming less about their practical heritage and more about fashion. The retailers have followed suit. In response to Strato: I don’t really have access to enough of the shop figures to give you a very specific answer to that question I’m afraid. The shop isn’t struggling, so women must be buying these products, but I think given the choice between buying something that may not be exactly what they’re looking for in terms of colour, name or function, and not undertaking an outdoor activity, many women will choose the former (or, as Clodia says in her comment, will opt for menswear instead). I would say that the shop is very much following the market. I have experienced very similar things in a range of outdoor shops, and it seems like these retailers just haven’t really tried marketing the women’s products in a different way. Just catching up with reading this blog and *had* to comment on this. Its so true! If you don’t want a waterproof that is pink/purple you’re then left with a very limited choice. I’ve also recently taken up cycling and its not much better there either. Particularly, the men’s range of fluorescent clothing seems much broader than the women’s, where there is comparatively less choice – apparently only men want to safe and seen on the road.